Point-Box on card: 20 bonus points (your opponent score points, when you play or use this card). Characteristics: affiliation, bonus points, Borg ship, Borg spheres. 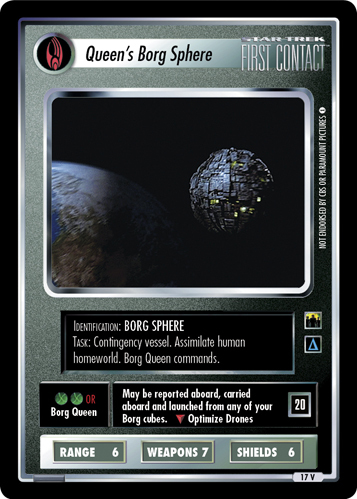 If you play OTF this card replaces the backward compatible 2E card Queen's Borg Sphere, Contingency Vessel from Genesis - ST1E compatible (the 2E card is no longer valide in OTF).